UPI was absolutely in love with the strange, the creepy and the absurd. The odder the story, the more they wanted to go after it. The company believed that readers were fascinated by the peculiar, and I have to say that I saw plenty of evidence that they were right. So if I heard about some story that was macabre or unusual, I went after it. This story, about grave robbing, is an example. NORWAY, Maine (UPI) – Oxford County Sheriff Alton Howe said Monday persons who robbed three graves in (the town of) Sweden may have been after skulls to sell to an out-of-state cult. Howe said three graves were opened at the Black Mountain Cemetery more than a week ago. Other counties have also reported the opening of graves, most of them more than 100 years old. The three graves, one of a woman and two of men, were dug up more than a week ago. The holes were six feet deep, five feet long, and two feet wide. Howe said the skulls appeared to be missing from each grave, but said the remains were in such condition it was hard to tell what, if anything, had been taken. “We found a set of false teeth in one and a few small bones and fragments of fabric and hair in the others,” he said. Most of the bones, Howe said, appeared to be from a foot. Another bone, which appeared to be a thigh bone, also was found. The grave robberies were not the first in the state in recent months. Another grave was opened at the Black Mountain Cemetery last year, and other grave openings have been reported in Cornish, Waterboro and Fryeburg. In addition, there was a twist to the previous grave opening at the Black Mountain Cemetery. In Waterboro, Leland Swett knew about the grave openings in that town because the robbers had dug up the resting places of some of his relatives. The diggings there took place in the Swett Cemetery, a private burial plot on Ossipee Mountain. It wasn’t known if anything was taken from the graves, because the local road commissioner filled the graves back in. Howe isn’t sure what the diggers were after if it wasn’t the skulls. I haven’t posted any examples of political writing to this point, but that’s what I spent a lot of time doing when I was a reporter for UPI in Maine. My office was on the fourth floor of the Maine State House, and most of my days were spent covering government hearings, legislative sessions and gubernatorial news conferences. In this case, a national presidential candidate came to town. I don’t really recall this visit by Eugene McCarthy in 1975, but I’m sure I considered it a break in the usual routine and a chance to get some national coverage for one of my stories. AUGUSTA, Maine (UPI) – Independent presidential candidate Eugene McCarthy says both major political parties are in trouble, and the Democrats are in more danger of extinction than the Republicans. McCarthy, a former senator who ran for the Democratic presidential nomination in 1968, said Thursday an independent stands a good chance in the presidential election next year because of the public’s growing disaffection. McCarthy said the Democrats have lost sight of their objectives and could be in danger of fading away. The former senator said there is the best chance of the past 30 to 40 years for an independent to be elected president. McCarthy came to Maine to talk with independent Gov. James B. Longley about a suit the two men are involved in which challenges the federal campaign funding law. The suit goes before the U.S. Supreme Court Nov. 10. McCarthy said the campaign law discriminates against independent candidates and works to perpetuate the existing parties. McCarthy said he felt the suit would result at least in changes in the act. “We’re very optimistic. It is our feeling that even if it is constitutional it is a very bad act, and we’re hopeful we can stop it,” he said. The act limits contributions to $5,000 to any one candidate and to $25,p000 in any election; requires that contributors’ names be made public; imposes spending limits on candidates; and provides federal funding to the party candidates. Longley, who attended the news conference with McCarthy at the Blaine House, said the federal act serves to discourage people from running for office. “I think we need to do more to encourage people to run for office,” he said. McCarthy said the act has made it difficult for him to run for president. “It’s made it difficult to finance our campaign,” he said. “It gives a clear advantage to the Democrats and Republicans by giving them funds to start with. Back in the 70s and 80s, UPI offered a regular diet of feature stories to its newspaper clients. Since I worked in New England, my weekly 500-word feature was distributed along with the work of people in the other five New England states in a package called New England Horizons. Maine was rich in feature story opportunities, so this chore was usually fairly simple to accomplish, and the lighthearted nature of these stories was a welcome break from the usual grind of stories about state government and politics. Lakewood, a nationally-known summer theater, was usually good for at least one feature story per year. 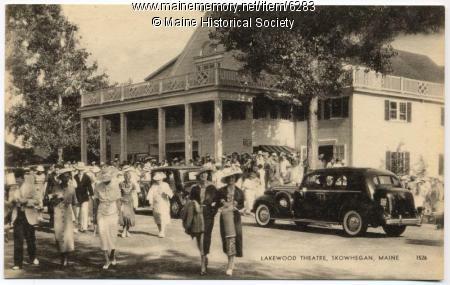 SKOWHEGAN, Maine (UPI) – The play first produced at Lakewood in 1901 comes back this year as the oldest continuously operating summer theater in the nation celebrates its 75th anniversary. Lakewood began in a roller skating rink at the end of a trolley line at the very start of this century. And it hasn’t missed a season since “the Secretary” was first produced way back then. For Joe and Katy Denis, who have been operating the theater the past three summers, finding a script for the “The Secretary” was a difficult task. Kuss searched for a year and a half, and finally found the original script in a library in Philadelphia. “We’re sort of starting the season with the very oldest and ending it with the newest,” Mrs. Denis said.